It is with heavy hearts that we must announce the passing of one of the greatest contributors to our art. Last night, Denny Haney passed peacefully in his sleep after a brief battle with cancer. Denny was a proud American and a Vietnam Veteran having served four tours of duty stationed near the mountains in Pleiku. Upon his return to the US, after serving his country, he began his career as a professional magician. All through the 1980's and early 90’s he was a very successful corporate entertainer. He wanted to give back to the magic community so he took the money he earned on the road, and opened up a studio where magicians could come and learn, practice their craft, rehearse and exchange ideas. As many of you know, his daughter Dawn has been running the shop during his illness. We kindly ask that you respect his family's privacy at this time and refrain from calling. We will continue to process orders in a few days. We will be updating with more information about Memorial Services as they become available. For those of you that didn't know or experience Denny, he was a magician's magician. He wasn't out to make a buck on you. He only wanted you to get the best props and would steer people away from garbage. Before the internet when you bought stuff my check or money order, I had a friend who needed a prop for a show. He called Denny and luckily he had it in stock. He told Denny he'd overnight the check. Denny told him not to worry. Denny would mail it out that day, send the check when you can. THAT'S the kind of guy Denny was. Let's say you wanted to learn the dancing cane. You could spend all day in his shop practicing moves, trying stuff out that Denny would show you. Then you decide that the dancing cane is not for you. No problem. Back on the shelf. 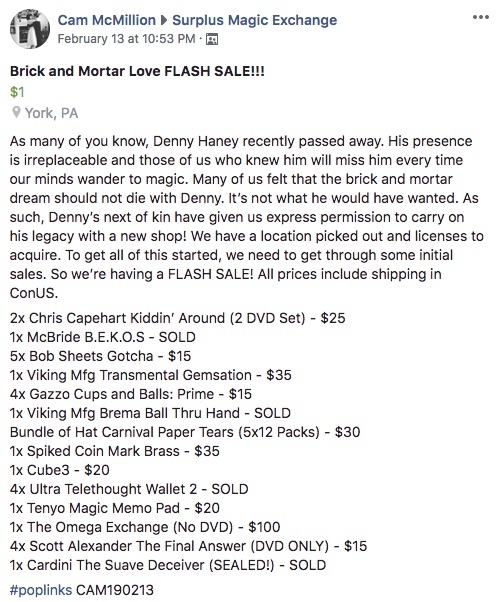 That's the kind of guy Denny was. Denny and Lee's wasn't just a brick and mortar magic shop, it had soul and a beating, caring heart. Never made it to either of the shops, but wish I had. . And I get to DC and LV occasionally. Bought most of my Scotty York stuff by mail from hi though. Seems like he was a great guy. Quick update time: The Denny and Lee Magic Studio is permanently closed. So sad to hear that. Denny was a class act. Although I appreciate the convenience of online shopping, for me there’s nothing like an old-fashioned brick and mortar store with real live demonstrators. How few still remain? That's too bad. I never made it far east enough to visit in person, but when ordering by phone or online I always enjoyed knowing that I was dealing with a real, honest-to-God shop with a veteran performer behind the counter. In my head, Denny & Lee's was the ideal of what a magic shop should be. When I lived in Delaware my weekends often consisted of the hour and a half drive to Denny's shop. I had several great conversations with him. My greatest memories were browsing through the endless amounts of literature he had accumulated. Every so often he would come back and pull a book, or a set of lecture notes and hand them to me...he always new what I was looking for even if I didn't!